On Thursday night, Arizona joined other states that share the river basin in agreeing to voluntary water conservation plans. Its legislature approved a plan that helps balance the state’s competing water rights with of those of California, Colorado, Nevada, New Mexico, Utah and Wyoming, along with Native American tribes and Mexico. The states faced a Jan. 31 deadline for completing interstate contingency plans on water rights; without them, federal officials could order mandatory cuts later this year. Only a California water district had yet to agree. A crisis point in the region has been approaching for years. When the regional water arrangements were first devised in 1922, assumptions about the river’s bounty were way off because they were based on data from wet years. Even when the mistake was recognized decades later, managers continued to permit new withdrawals. And as dry heat has enwrapped the Southwest, the great river’s flow has been going down while cities and farms slurp up ever more water. The gap between supply and demand can no longer be papered over by shunting billions of gallons of the river’s waters back and forth among reservoirs in what has been one of the nation’s most significant attempts to adapt to climate change. To the contrary, recent scientific research shows that the Colorado’s flow is very likely to drop even more in the years ahead. What’s Reducing the Basin’s Runoff? The results “overwhelmingly indicate” the vulnerability of snowpack to a warmer climate,” wrote the authors, from the University of Utah. 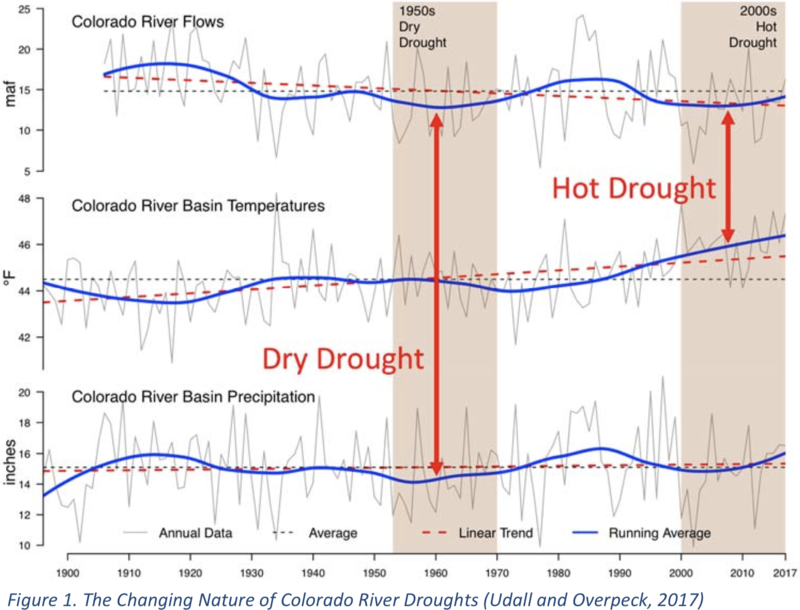 The term “drought” may not be useful anymore because it implies a short-term condition with an end in sight, said Udall, who works for the Colorado River Research Group. He calls it aridification instead, and says the negotiating over sharing the water is a dry run for the future of water use in the Southwest under climate change. The lower end of the river basin, in Southern California and Southern Arizona, is already one of the hottest parts of the country. The 2018 National Climate Assessment shows places like Phoenix and Las Vegas will have more frequent heat waves with extreme life-threatening temperatures in the decades ahead. Those extremes will also affect agriculture in the lower basin, but these types of impacts haven’t even been considered in the current Colorado River talks, Udall said. The Drought Contingency Plans are designed to keep Lake Mead’s water level above a threshold that would trigger disruptive mandatory cutbacks in water use. Upper Basin states have agreed to keep enough water flowing to the desert lowlands. And the lower basin states, now including Arizona, have agreed to divert less for farms and cities in order to bolster Lake Mead. Water engineers, planners and scientists understand how global warming threatens water supplies and are generally averse to risk, Overpeck said. That’s not always the case in politics. Overpeck, who recently moved from Arizona to Michigan, said global warming was part of his family’s decision to leave. Among other things, they were worried about the value of their property in the coming years. “If we don’t deal with climate change, the Southwest will become a place of exodus. It was getting depressing to see politicians writing off the future of the Southwest,” he said.